Cave map for the first epic-tier battle against the Orc Lord’s minions [Copyright 2016: Pelgrane Press]. One of my largest commission in recent years was a series of maps for Pelgrane Press’ 13th Age role-playing game. Their Battle Scenes line provides ready-to-play encounters tied to the iconic powers of the Dragon Empire setting, and for the first issue “High Magic & Low Cunning” I created maps for the Orc Lord, Prince of Thieves and High Druid encounters. 1. The introduction and Battle 1: Catch of the Day are available from Pelgrane Press directly. 2. Battle 2: Zip-Lines and Wardrums can be download from Six Feats Under. The maps are included in black and white in the book and as hi-res pdfs with the download, but they are also available separately in gorgeous color print in the “Map Folio” for High Magic & Low Cunning. Where does this stone door in the hillside lead? One thing is certain: It is connected to the Prince of Shadows [Copyright 2016: Pelgrane Press]. And now Pelgrane is working on the second installment in the series: The Crown Commands. I am providing maps for the Lich King series of encounters. Recently I’ve revisited a very old commission of mine, one of my very first in fact. Back then I produced several maps for a series of PbEM games by Rich McDowell, author of Alamaze. Rick needed a map for a newer game/scenario done, and I was happy to break out Mike Schley’s overland style for CC3+ to give the game board a new treatment. 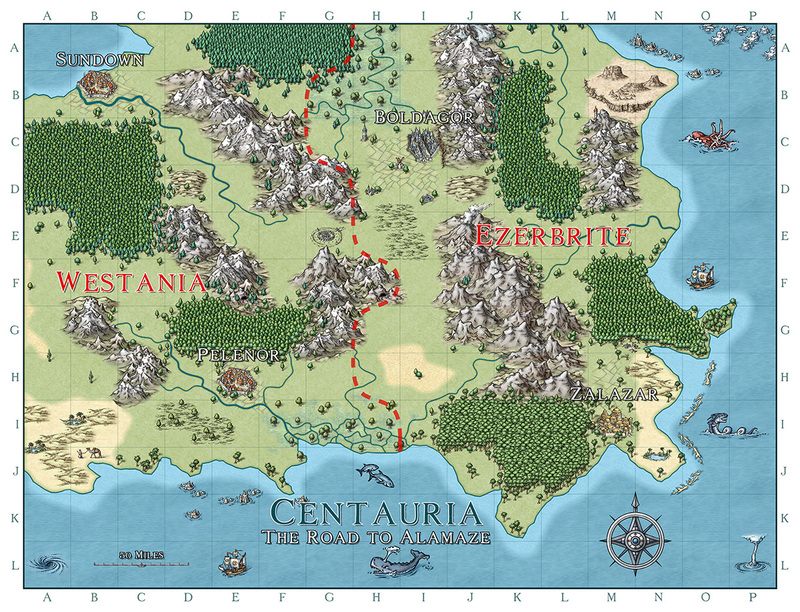 Click the map image for a larger version of the PbeM game map for Road to Alamaze – Centauria. You can find more information on the game here. The square grid of the game board necessitates a block-ish design and it’s fun to still try to give it a natural feeling. 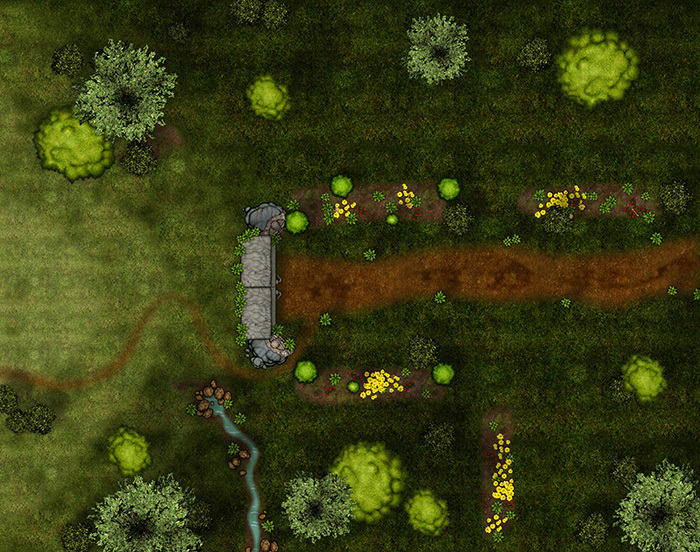 For example the original draft did not include any rivers (as they have no game effect), but the landscape feels much more real with some included. 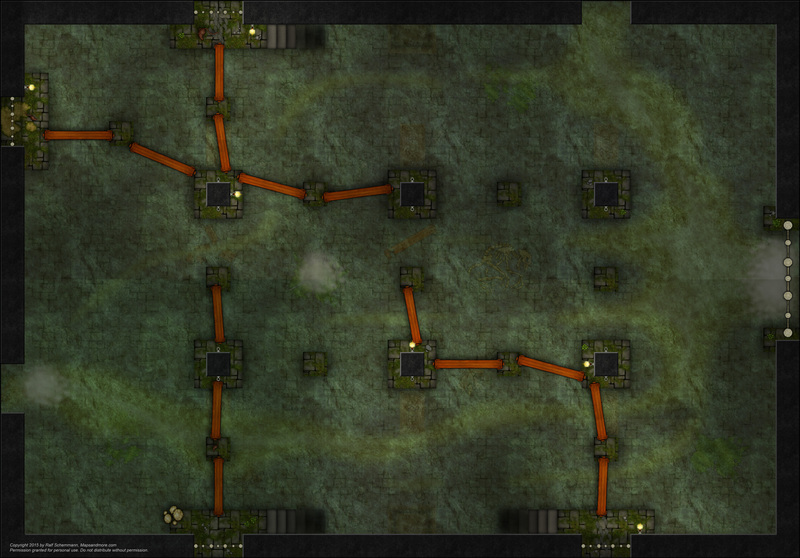 I’m very happy with how the map turned out, and hope the players will have many hours of PbeM fun with it. 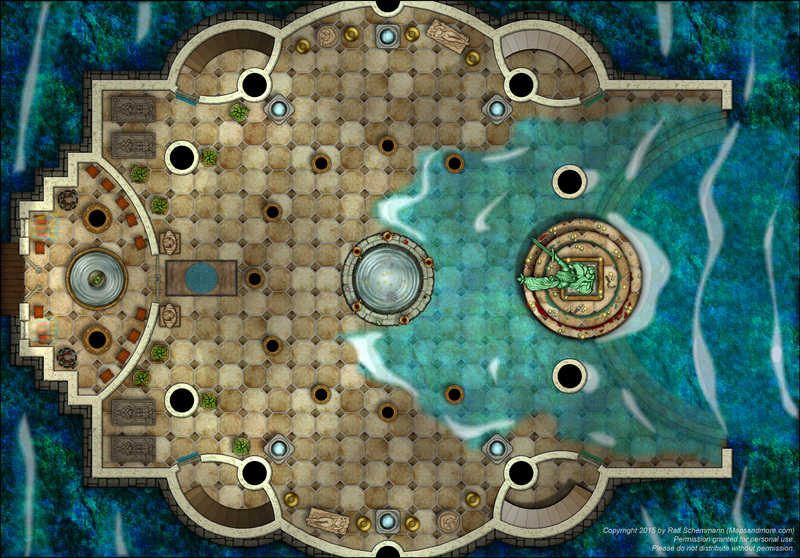 Here is another battle map from our 13th Age game: The Temple of the Sea. Our heroes traced a series of out of control temple guardians back to the new temple of Poseidon at the docks in Drakkenhall. With the sea rolling in and out of the temple, up to their bellies in the surf (or higher in the case of the gnome), they faced the temple’s high priestess, a sahuagin necromancer and his 4 zombie servants, plus the animated statue of Poseidon in an epic showdown. Click on the map to load the full-size version of the image, ready for A1 printing at 150dpi. 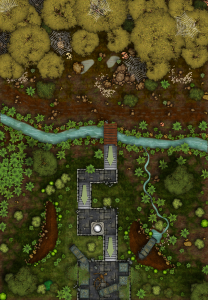 Here is a battle map I created for our current 13th Age fantasy campaign: A large cistern or sewer hall, with wooden walkways leading across the water. It’s about A1 size and should print fine with about 80cm by 60cm poster printing. Click on the map to load the full-size version of the image. Here’s a little tidbit from our current rpg campaign (Gumshoe – Ashen Stars). After an unfortunate series of events around the Acheron Translight Snarl our crew’s trusty Runner-class ship, the “Jolly Jumper” is no more. While narrowly escaping from the D’Jellar anomaly a pilot error resulted in a fatally flawed exit vector from the snarled translight corridor. The lasers barely managed to escape in the ship’s shuttle and had to watch their beloved home break up into a billion pieces. But as the saying goes, “true lasers are never long without a ship” and an opportunity presented itself, involving a Bleed-wide warrant, a high-level Combine operative, an anti-piracy operation, a staged prison escape and a conveniently-parked Hauler-class starship. So the laser crew finds itself in the possession of the “Brocken”. A bit worn, the paint scratched in many places, it is still a translight-worthy laser vessel which holds the promise of a better future. Haulers are the less-than-glamorous, slow and sturdy workhorses of the Bleed nowadays. Designed to carry a maximum of cargo, they provide the surviving worlds of the Bleed with much-needed resources that are not locally available. 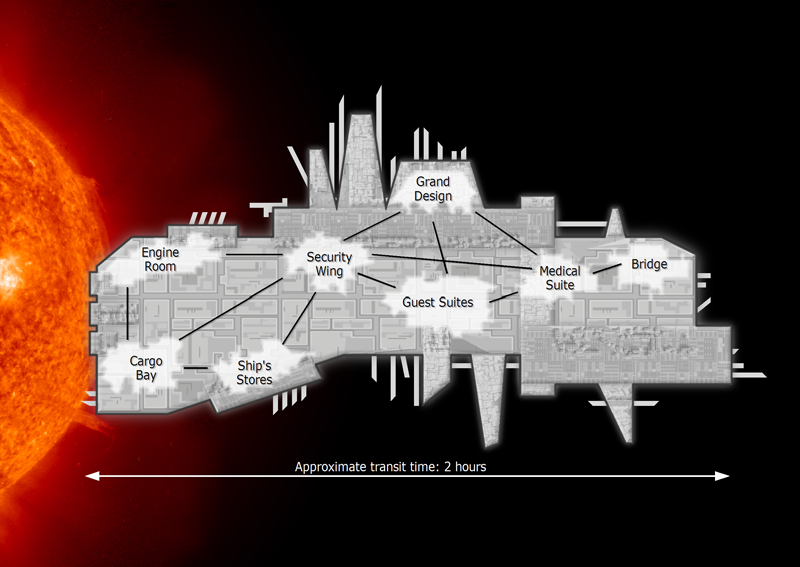 The image shows the main deck with its six massive cargo bays, the cut-down engine room and the richly furnished “boardroom” which is used to conduct business meetings. 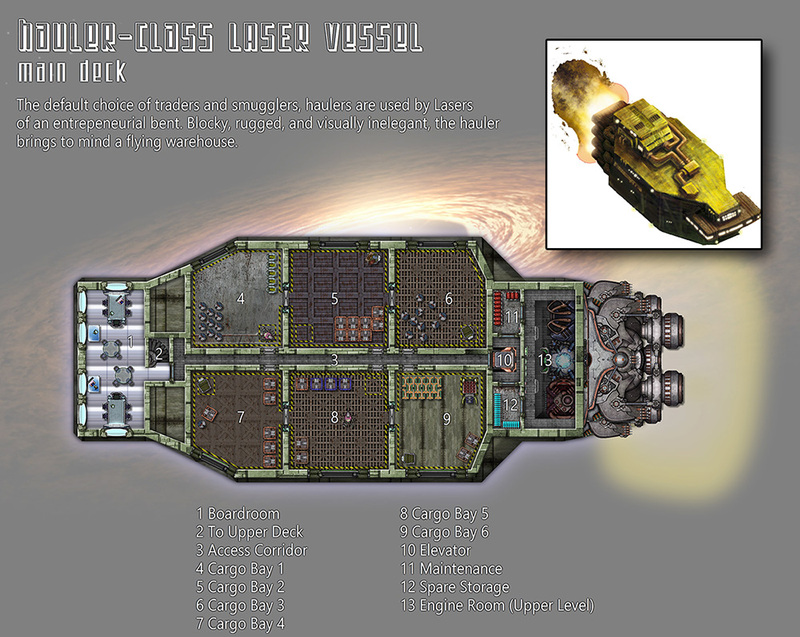 The full deck plans for this ship-class are found in the “Accretion Disc” companion for Ashen Stars and were drawn by yours truly with the Cosmographer 3 add-on to CC3. 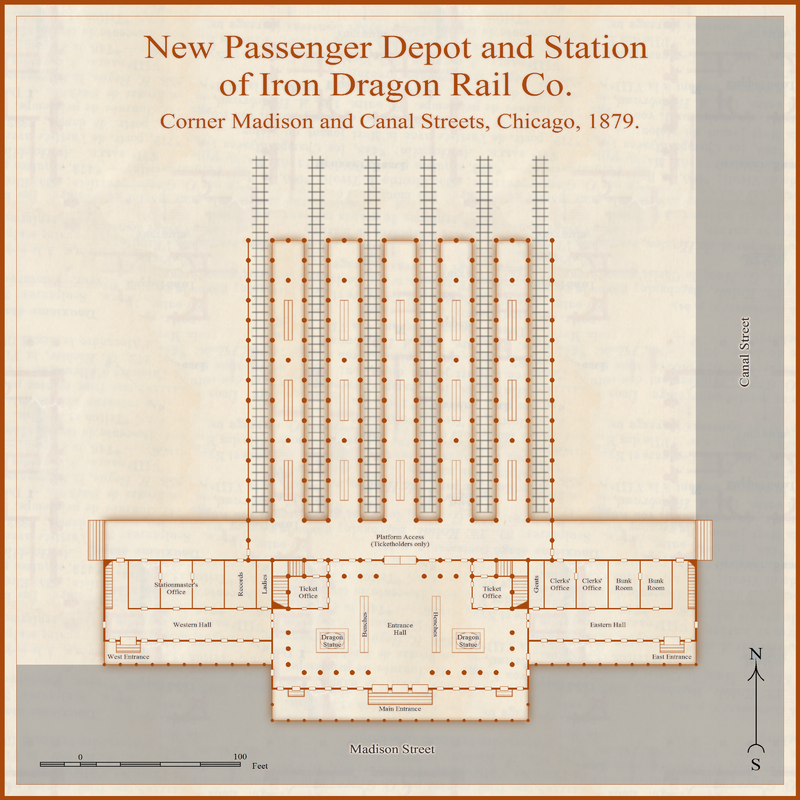 For an upcoming Deadlands: Reloaded game I mapped a fictional railway station, loosely modeled on a historical one built in 1881 (and later replaced by Chicago’s famous Union Station). 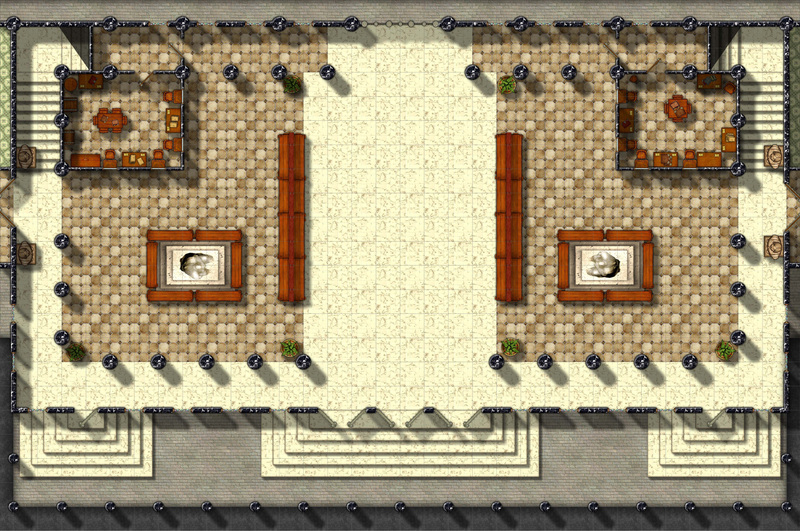 The map can be used for other quasi-historical games (e.g. 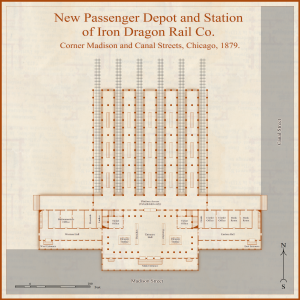 any Cthulhu or Pulp-genre game) where a medium-sized railway station is needed. I first created a Baedeker-style floorplan of the station, using Campaign Cartographer 3 and its “1930s Travel Guide” style from the Annual Vol 5. It is fairly simple and painless to print, so it makes a great reference map. You can download the CC3 version of the map. Then I went ahead and from the entrance hall section created a detailed battle mat with (Dungeon Designer 3 and Symbol Set 2) for use with miniatures. Ashen Stars is a wonderful space opera rpg by Pelgrane Press, based on the GUMSHOE system. 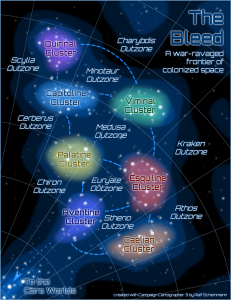 I had the pleasure to create the game’s published setting map (a part of the Galaxy called “The Bleed”) based on a sketch by Robin D. Laws. Lately I got to revisit the setting when, after play-testing the upcoming Terra Nova adventure, Simon asked me to create a simple black and white diagram of the adventure’s featured luxury liner. You can see the result below (the color background was added for web display). 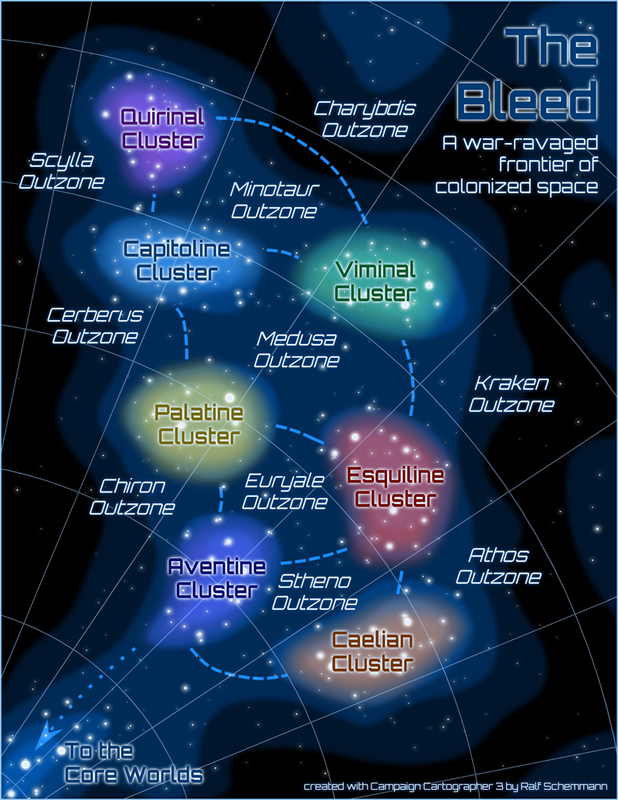 While the exact layout of the ship isn’t important for the story, the relative position of the important locations is, and the map shows those. 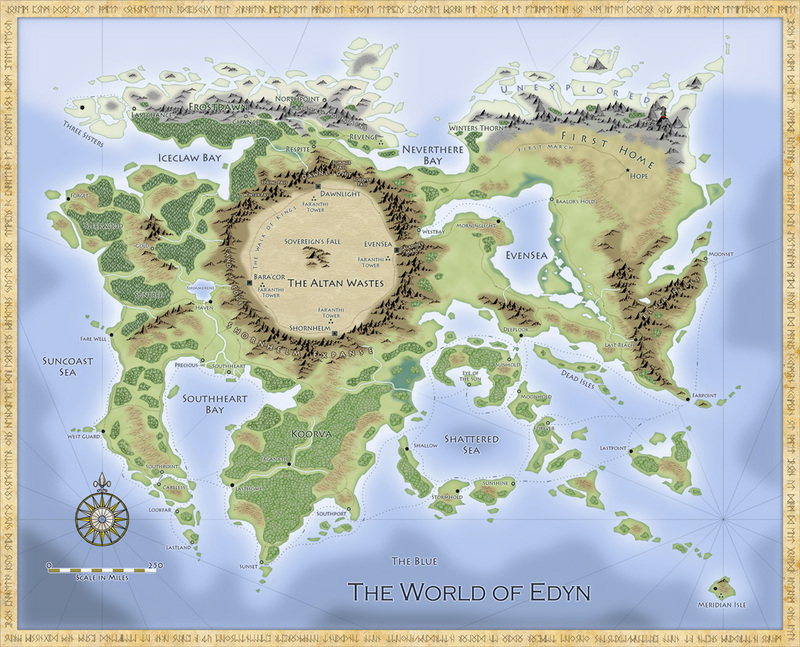 This is a map I created for the upcoming novel “Mythborn: Fate of the Sovereign” (Book 1 of the Mythborn Saga) by Vijay Lakshman. 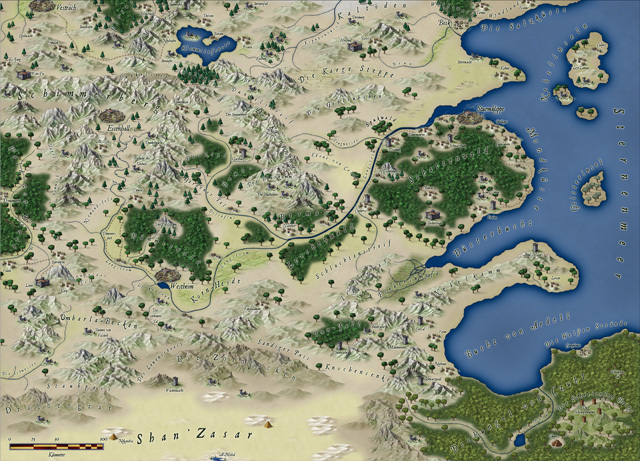 The map uses the Fantasy Worlds style by Pär Lindström, published in the Cartographer’s Annual Vol 3 and is optimized for printing at a smaller size. I had only a very rough draft of the continent, with a number of textual descriptions, and it was fun to create a pleasing map from that information. Mythborn: Fate of the Sovereign, featuring this world map, will be launched shortly. For more info, go to www.mythbornbook.com. Help the author out by ‘liking’ his author page on facebook. Here is a free battle map for your private use, showing some overgrown ruins in a forest setting. 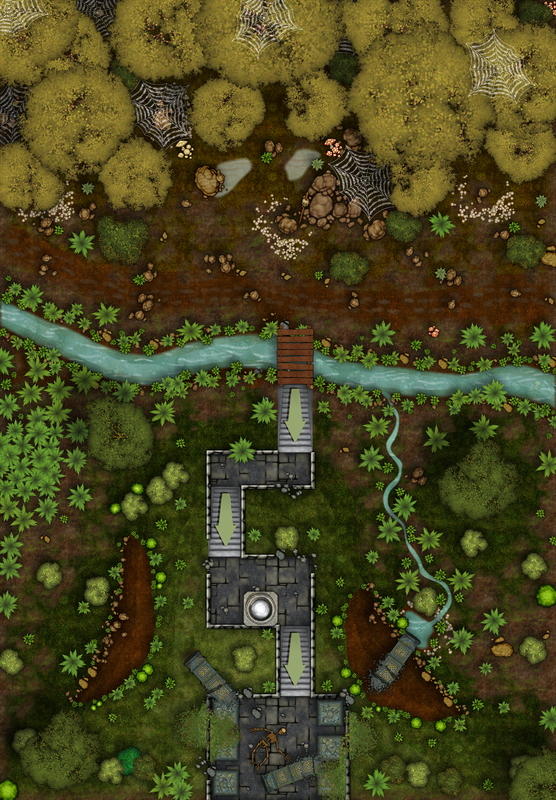 The map is A2 size and was created with Profantasy’s Campaign Cartographer 3 including the Dungeon Designer 3 and Cartographer’s Annual Vol 5 add-ons. This map is released for private, non-commercial use. Please contact me, if you’d like to redistribute it. For the small-press German role-playing game “Dungeonslayers” I created this version of their setting map “The Free Lands” in CC3. While I did that simply as a fan, the author Christian Kennig approached me whether they could offer the map as a download on the Dungeonslayers website (for free) and also sell it as a printed poster map. We quickly agreed on a deal, and the map can now be purchased via their web-shop. Click on the map to load a larger version. 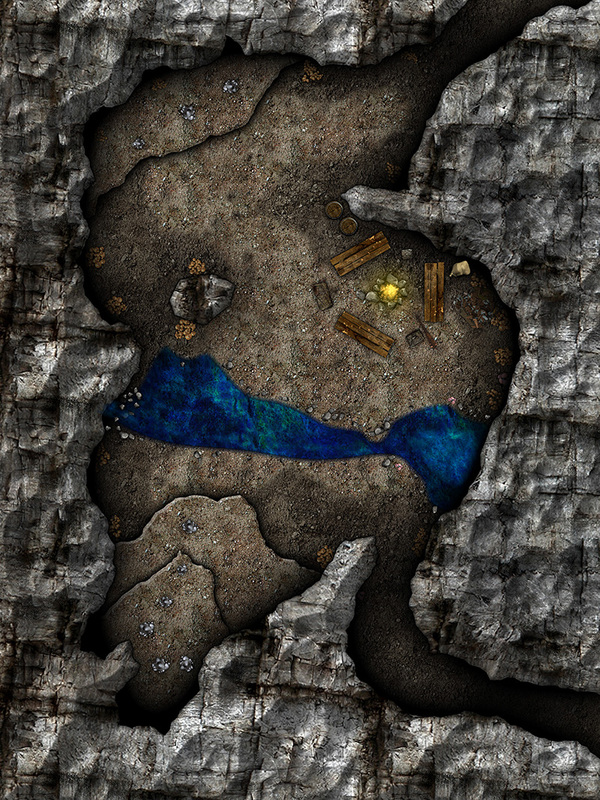 Download the CC3 version of the map (Campaign Cartographer 3 and Annual Vol 5 needed).